Who’s got your credit card number? Well there’s the man with the device transmitting information from your local ATM, there’s the man in the Indian call centre, and there’s the woman he sold it to last week. Then there’s the wine club you belong to, the shop where you buy your CDs, and the airline you flew with last year. Financial security sometimes feels like a joke – especially if you listen to all the fraud reported on the news. But there are still things you can do to tighten up the weak links. ‘Card not present’ fraud is the most common form of identity theft in the UK, costing millions every year. Fortunately most banks and building societies are extremely well-equipped to deal with this, and will usually call you at the first sign of an unusual transaction on your card. It’s hoped that the Chip and Pin system will help to cut down on this type of fraud. If you’re concerned, keep a close eye on your statements and request a credit check at least once a year. How Safe is an ATM? PIN-reading devices are more common than you might think. 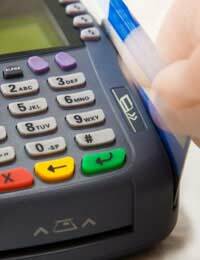 With the introduction of the new handheld Chip and Pin machines, fraudsters developed micro-spy devices that relayed card numbers and PINs to the unscrupulous operator. A well-known petrol retailer suspended all Chip and Pin payments last year when it discovered that these devices were being used to withdraw millions of pounds of customer cash. When you type in your personal data to order a book, log-in to a forum, or check-in for a flight, how do you know it’s secure? The answer’s in the URL. Just look at the top of the browser – every page of a secure transaction should begin with “https://”, indicating it’s a secure, encrypted site. However, many dozens of websites request personal information on pages that don’t begin with that crucial code. Ryanair and BT have been found guilty of this in the last couple of years, neglecting to encrypt a log-in page or the pages where travellers input their check-in details. Fraudsters work hard, and they’re quick to pounce on the smallest error. So whenever you enter your details on a website, take some additional precautions. To protect your personal and financial data, it’s crucial to use a different password for each online application that you use. Unfortunately, most of us can only remember a couple of passwords at a time, and that’s before we tried to remember our shopping list. Although you should never write down your passwords, you could keep a list of ‘clues’ that only you can translate. Here’s an easy way to invent passwords that are easy to remember – but hard to crack. Write down the opening line of your favourite film or book. Take the first letter of each word. Swap the letter ‘I’ for a ‘1’, the word ‘to’ for ‘2’, ‘for’ for ‘4’, and so on – making substitutes for numbers where you can. You now have a password containing a mixture of letters and digits, with no coherent meaning. Perfect! A password safe, like the name suggests, is a virtual ‘locked-up’ place for storing passwords. You can download free password safe software on the internet, and save it to your PC. Then all you have to do is remember one password (to open the program) and it will store and auto-complete your usernames and passwords for the dozens of sites that you use. Password safes work by encrypting your data, turning a simple 6-character word into a complex string of code, and translating it back when you need it. When you place an order online, check for the security icons: a padlock at the bottom of your browser, and an URL that begins with “https”. Click for the check-box that lets you opt-out from information sharing. Companies which intend to pass on your personal information are obliged to ask your permission. Never write down your passwords. Pick words that use letters and numbers, and if you forget them, put them in a safe.